Digital asset prices have been dipping in value again after a few days of price consolidation. At the moment, the entire cryptocurrency economy is awfully close to dropping under the psychological $100 billion market valuation. Furthermore, since our last markets update cryptocurrency global trade volumes are weaker than usual, with only $11.5 billion worth of assets traded over the last 24 hours. Crypto-market prices are sliding again as the top 10 digital assets have seen 24-hour losses between 2-13%. At the time of publication, the entire market capitalization of all the coins in existence is $104.2 billion today. Currently, bitcoin core (BTC) prices are down 3.8%, on Friday, and 2.8% over the course of the last week. This gives BTC a global average price of about $3,302 and the value is lower on certain exchanges. Moreover, bitcoin core has a market valuation of about $57.5 billion which is 55% dominance over the entire digital asset economy. 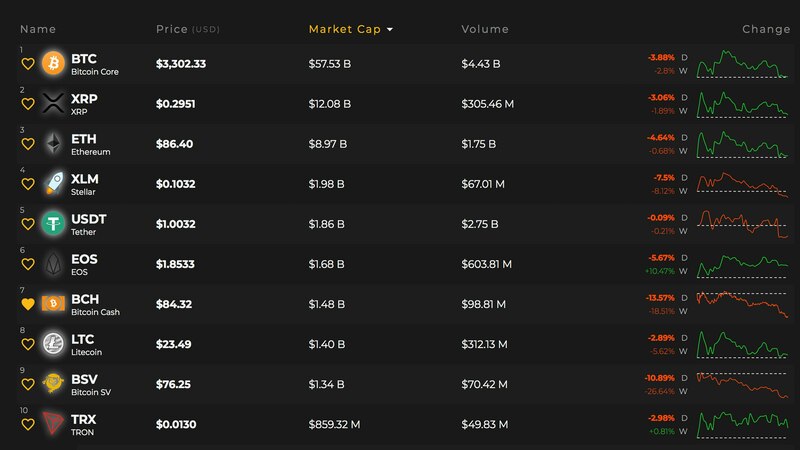 Top 10 cryptocurrencies on Dec. 14, 2018. BTC is followed by ripple (XRP) as the market captures $12 billion and each XRP is being swapped for $0.29 per coin. Ethereum (ETH) holds the third position but markets are down 4.6% and ETH is being traded for $86 per token. Stellar (XLM) takes the fourth position today as each coin is trading for $0.10 a piece. However, XLM markets have lost over 7.5% during the last 24 hours of trading. Lastly, the current ruler of the fifth position is the stablecoin tether (USDT) which is trading for a U.S. dollar and once in a while a few pennies above 1 USD. Bitcoin cash (BCH) is the seventh largest market valuation just before the weekend and the entire BCH capitalization is only $1.4 billion. 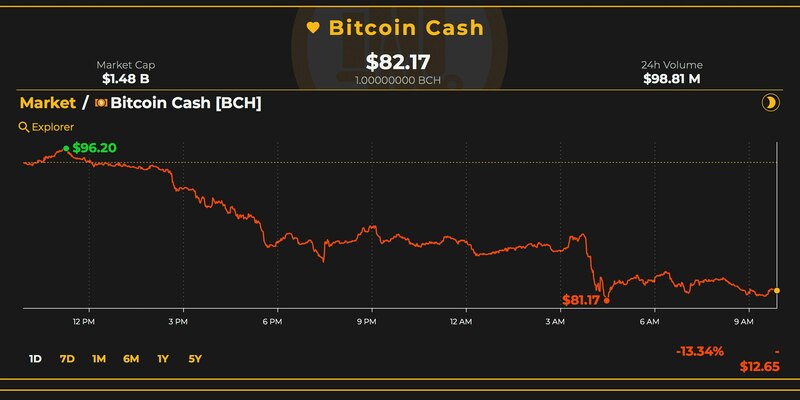 BCH prices during Friday’s trading sessions are down 13% over the last 24 hours and over 18% for the week. 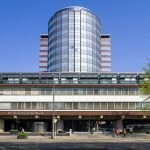 This action has given BCH a value of about $82 per coin with roughly $98 million in global trade volume. Bitcoin cash trade volume has increased since our last market update which is a positive sign. 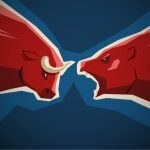 The top five exchanges swapping the most BCH include Lbank, Binance, Kraken, Huobi, and Coinbase. During our last four market updates, ETH had dominated BCH trading pairs over the last few weeks. On Friday, BTC captures the most trades against BCH with 28.5% of global trades. This is followed by ETH (26.5%), USDT (22%), EUR (9%), and USD (6.4%). 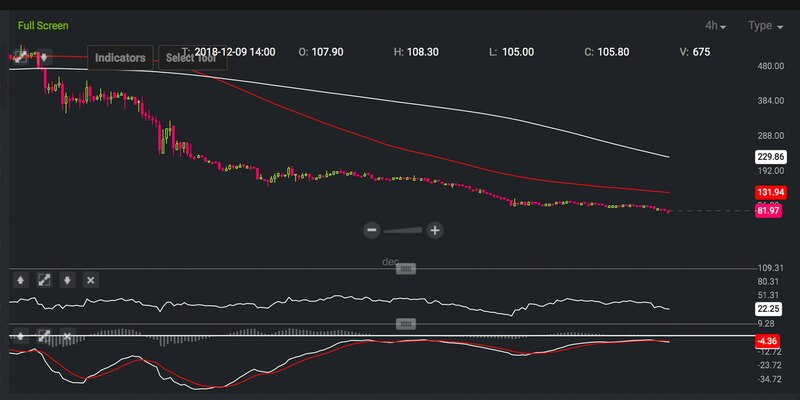 Looking at the BCH/USD 4-hour chart on Bitstamp indicates that bears have the reigns again today. The long-term 200 Simple Moving Average (SMA) is still well above the short-term 100 SMA trend line. This shows that the path towards the least resistance is still very much the downside. The Relative Strength Index (RSI ~21.96) is also indicating extremely bearish conditions as the RSI is still showing an oversold market. Stochastic and MACd readings show a similar downside trajectory as there will need to be some surprise bull action to make things less dreary. Order books on the upside show bulls have some resistance from now until $100 and some smoother seas from there. On the backside, support is pretty decent from the current vantage point up to $75 where buy orders start to get slimmer. Bitstamp BCH/USD trading view 4-hour chart on Dec. 14, 2018. This December is showing that cryptocurrency values are not as bright as some people predicted throughout the course of 2018. 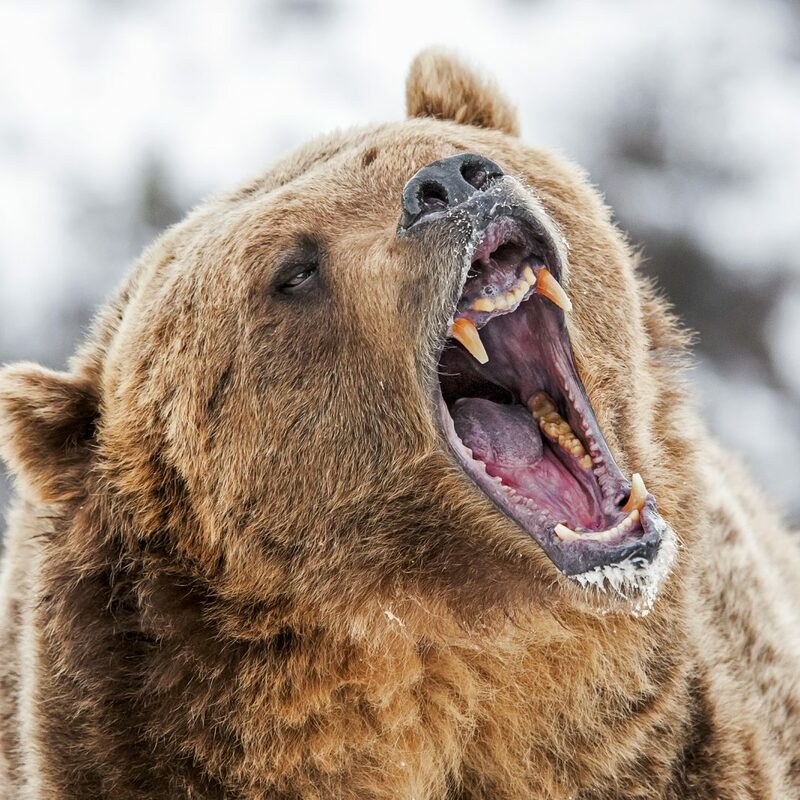 Being so close to the end of the year, Fundstrat’s Tom Lee has stated that he’s getting “tired” of cryptocurrency price predictions. Lee stated multiple times this year that BTC prices could hit a target of $15,000-25,000 by the year’s end. According to Lee’s note to clients this week, the Fundstrat Global Advisor says BTC’s fair model price should be between $13,800 and $14,800. “Given we are so close to year-end, we are not providing any updates to near-term price objectives — read this as, we are tired of people asking us about target prices,” explained Lee on Friday. Given the steep discounts of [bitcoin] to our fair value models, the excessive bearish sentiment about fundamentals does not seem warranted. Lee’s fair market value is still more than $10,000 higher than today’s BTC spot prices. Further, with the price so low BTC/USD, and ETH/USD short positions are still at all-time highs this week. This means more so than ever individuals and organizations believe prices are going to drop again. A large portion of the top digital assets continue to slowly drop into a narrowing price range with no signs of any significant price bounces ahead. 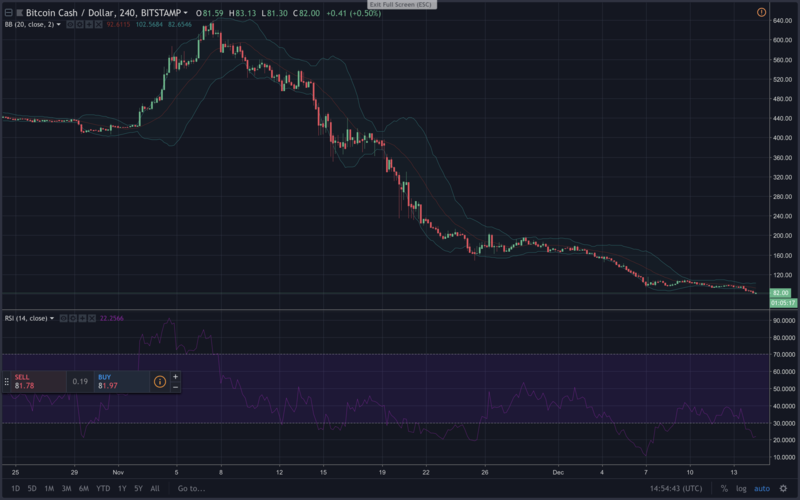 As long as BCH, ETH, BTC, and many other coins ride below their 200-day moving averages and show extremely oversold RSI levels, traders will remain skeptical.